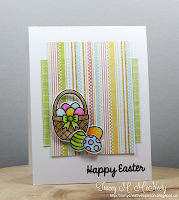 Easter is on its way and I'm getting some cards ready to send, so I thought I would play along with some challenges, too. Details for how I made this card and supplies listed are below. My interpretation from Tracy McNeely's beautiful card was to make an Easter card and use some soft pastels that I haven't done in a long while. This one was a little more complicated than I wanted it to be, but here goes: I used the MFT Brick Coverplate as a stencil and blended some distress inks to make the background. I cut the panel with MFT Stitched Rectangles and then again with the MFT Stitched Basic Edges to get the pointed edge. The current sketch dictated the elements. I stamped the bird and Easter rabbit ears and then die cut them, as well as the sentiment. I cut the little circle with a basic circle to allow the bunny ears to pop out. The die cut hearts were a freebie that Paper Smooches included in one of my orders...I didn't even know they were going to do that and I use these little hearts all the time! I used Wink Of Stella on the hearts, but to tell the truth, I don't really see the attraction for it, it never really shows up very much. Oh, and I ran the left over edge from the panel through with the stitched rectangles one more time to make it a little square so the bird looked as though her were standing on something. There you have it! Haha! Love the peep of the bunny ears in the window! So glad you joined us at Muse this week! Fun, fun card. Love the ears peaking. The bird's expression is perfect. Somcute that the bunny is peaking out from behind the circle. He is supposed to stay hidden after all. Lots of different techniques going on the blending using the cover plate as a stencil is one of my favourites. Thank you for sharing with us at Muse this week! love the colours on your brick work. This is adorable! 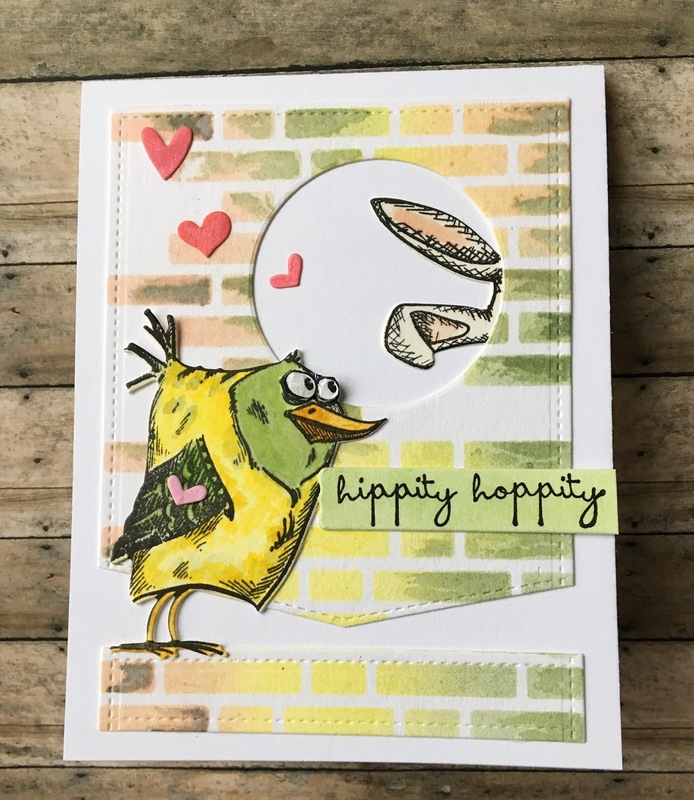 Love how you used the MFT sketch here and that brick background is gorgeous!